It’s pretty hard for anyone to argue that the Motorola XOOM is not an incredible product, but that hasn’t stopped the onslaught of angry would-be customers over its $799 premium price tag. 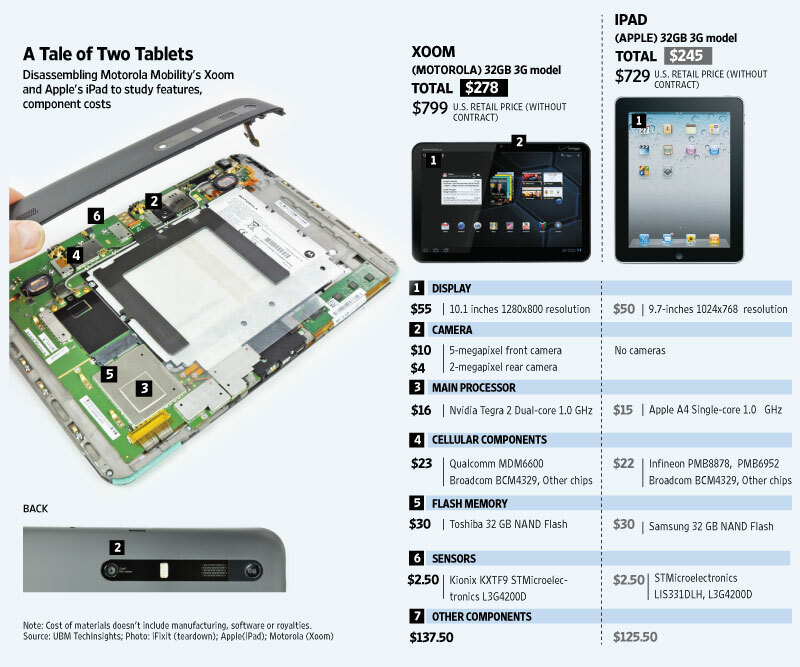 And thanks to the WSJ, we can see the exact breakdown for the pricing of each component and how it compares similarly to that of the original iPad. The numbers are definitely close even with a bigger/better screen, dual-core processor and 2 different cameras, but it’s hard to forget the fact that the iPad2 is going to be announced tomorrow and will have newer parts than the original at roughly the same cost. They’ll also likely introduce a cheap WiFi-only version which will appeal and sell to an enormous market, while Sanjay and the boys spend time twiddling their thumbs over when to release theirs. Verizon CFO: Tiered Data Plans Coming "Mid-summer"